23:59 EST Wednesday. I will then have Thursday to complete reading the entries and compiling the links and such. I do read all entries. You can ask any of my Haiku Challenge family/community members. If you do write a piece of fiction that goes past the PG level, copy the link into the comments of this post and make a note of it being such and give the reasons you think it is, such as violence, sexual content, language/profanity. If your blog is with WordPress, TAG your post as Friday Fiction with Ronovan Writes and in this way people may find your work in the WP Reader. It is possible, depending on the success of our challenge and the quality of writing, I may want to publish Anthologies, collections of stories, on Amazon in a FREE e-book format. IF YOU ARE INTERESTED IN ALLOWING YOUR WORK TO BE SHARED IN THIS FASHION CLICK HERE FOR DETAILS and a form to fill out. If you just want to write, enter, and have fun then you don’t need to do anything except write, enter, and have fun. And if you do try out the anthology idea and you change your mind you can always fill out the form and do what it says. It’s explained in that link. We’ll try the same type of prompt as last week. Choose at least two from the following list to be featured in a work of fiction for this week, and to make it simple, there will be no word count limit. But please, no book lengths this time around. You can see my entry, The Library Date, by clicking HERE. 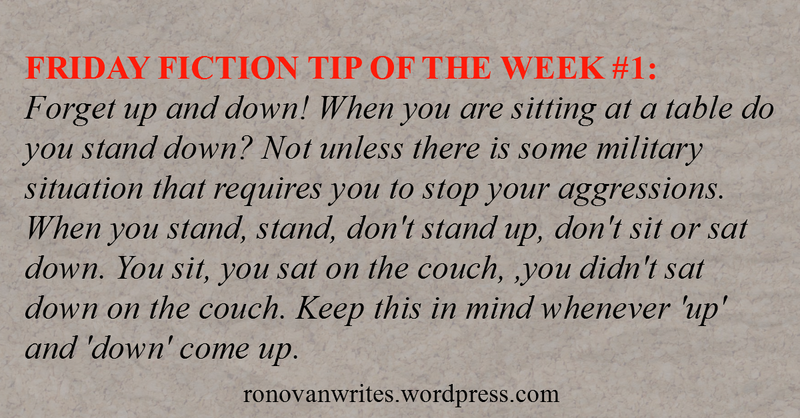 Great tip Ronovan. Thanks for that insight. Every day’s a school day and you might learn something new if not careful. Such an obvious overstatement now that you point it out! Enjoy the weekend. I’ve timed myself out on this one as I’ve been adding an episode every day this week. Here’s the link if anybody wants to read it anyway.